Sony today announced the release of a security update program to address potential security vulnerability resulting from a buffer overflow in some versions of SonicStageCP® music management software, announced by Sony on November 7th, 2007. SonicStage® users are requested to download the security update program in accordance with the following procedures. *Upgraded SonicStage® versions are also subject to this security update. This security update program fixes a potential buffer overflow when importing certain malicious play list (m3u) files that could cause the above listed versions of SonicStage® to crash and execute an arbitrary code. At the main program screen, click the Help option on the menu, and then click About SonicStage. At the About SonicStage window, check to see if the version number begins with 4.0, 4.1, 4.2, or 4.3. Only SonicStage versions 4.0/4.1/4.2/4.3 are subjected to the security update. 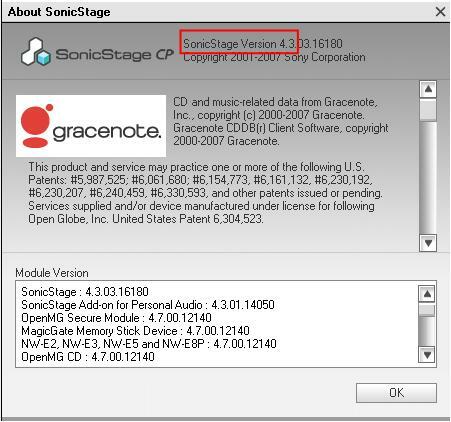 This update program is provided to users under the conditions of customer’s SonicStage® Software Legal Agreement. When downloading the security update with Windows Vista® or Windows XP®, execute update after logging on with user name that belongs to computer manager or manager. Windows Vista® may display dialog boxes such as "Windows® needs your permission to continue" which controls the user account. Check the content and continue operations following the displayed announcement. When downloading the security update with Windows 2000 Professional®, use the “Administrator” (single-byte alphabet and numbers) account. Download SonicStageSecurityUpdateProgram-1.0.00.11020.exe and save it on the Desktop. - The file can be saved at another location besides the Desktop. - The download file size is 3.11MB. Quit SonicStage® and all other applications. Double-click on the saved SonicStageSecurityUpdateProgram-1.0.00.11020.exe and follow the instructions to complete the update. 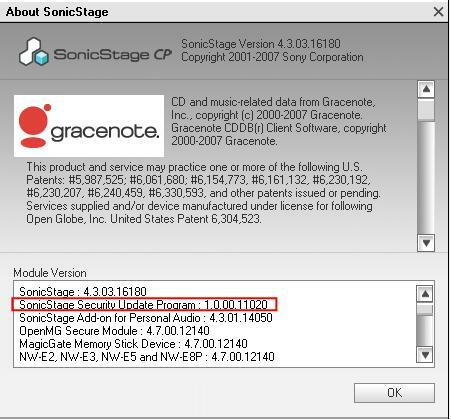 At the About SonicStage window, under Module Version, verify that SonicStage® Security Update Program 1.0.00.11020 is listed. Note:Please contact your local Sony office, if you encounter any problem while performing the SonicStage Security Update.